So today is the day: the last practice before we head out to Ohio and compete for the first time. There are a lot of emotions going into today. We have also had some major setbacks. Our uniforms (due to Hurricane Sandy) didn’t get shipped out, so our tumbling director drove to Pennsylvania to pick them up today. One of our bases had heart surgery last Friday and her first practice back is tonight. Stress factors? Sure, but this team can handle anything. As a coach, I try to take everything in stride and not let my team know that anything is bothering me. I will say that I am rather calm for it being the last practice before competition. I don’t have crazy nerves, no urge to throw up at the mention of warm-up times. What I am is proud. I’m proud of my team for how far they’ve come in the past 4 months. The time is here. The moment where hard work & dedication meets destiny. This is YOUR time to shine. Who would have thought that almost 4 months to the day after our building fell, we would be competing? We are going to shock the world when we step on stage. This team is 150% stronger & more talented RIGHT NOW than you were in May at US FINALS. Each of you brings an element of greatness to this routine. Have the confidence in yourself & your team and you are already coming out on top. I am so proud of each of you & how you have bonded as a team & stood up to the challenge. July 8 is a day none of us will forget – but it has given you strength. It has given you a motivation to be better than the best. We have nothing to lose. We have been through the worst. Make them FEAR THE TEAL. I leave you with 4 words – I. BELIEVE. IN. YOU. 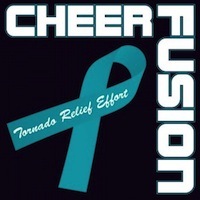 This piece was originally posted on Cheer Parents Central by Cheer Fusion coach Mandi Spina. ‹ Get-It Gear: Get Amped	› Expert Q&A: I Want To Open a Gym — Where Do I Start?